Richard came in to work raving about this cake he had over the weekend and thought that it would be a good post. He says you just have to try it, it was the best cake he ever had. He says he will take a picture when he give this a try in the meantime here is what it looked like. Add (in order) the Cooking Oil, Unbeaten Egg Yolks, Cold Water, Vanilla Extract and Lemon Extract. Beat, using a mixer, for 2 minutes. In a different mixing bowl, add the Egg Whites, and Cream of Tartar. 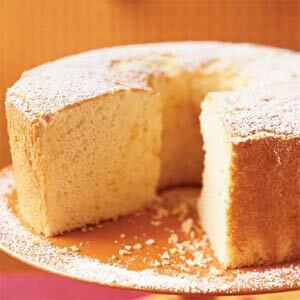 Pour into Ungreased, large, 2 piece Angel Food Cake Pan immediately (it’s a good idea to cut a piece of waxed or parchment paper to place in the bottom of the pan to ease removal of the cake). Bake in 350 degree oven for 55 – 60 minutes. After cake is cool, gently use a butter knife to run along the side to help free it from the pan. This entry was posted in Baking, Recipes from Friends. Bookmark the permalink. ← Nothing Special except the Person I made it for, Sunday Breakfast in Bed.